Carville have supplied critical precision machined plastic and Acrylic components into the life science industry for over 35 years, including many of the global companies such as the Danaher Group, Thermo Fisher, Novartis, Siemens Diagnostics, Horiba and Perkin Elmer. This is a significant market for Carville, especially for diffusion bonded manifolds and microfluidics. In Vitro Diagnostics (IVD), including Immunoassay, Clinical Chemistry, Molecular Diagnostics, and Haematology, is a broad term for devices that perform tests outside of the human body, to diagnose or monitor diseases or infections, and also to monitor drug treatments. They are typically performed on human samples of blood, urine, tissue, sputum or other materials. These devices are often complex and need to handle multiple fluids including reagents, samples, buffers, wash and waste as well as pneumatic control of valves, all of which need careful and precise control. 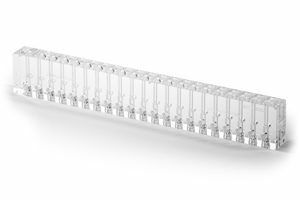 Carville’s multi-layer diffusion bonded plastic manifolds are often adopted to solve these many fluidic challenges. They have the advantage of being compact, lightweight, cost effective and very accurate, and do not involve any contaminates such as cements or adhesives. The increasing drive to shorten diagnosis times and costs is stimulating a great deal of new PoC devices and improved laboratory testing solutions. 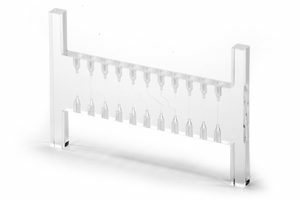 Carville’s microfluidic manifold chips offer many advantages in this field as the huge design flexibly can provide mixing channels, flow splitters, time delay tracks, optical imaging windows, reagent storage and introduction, and many other features. You can also design the fluidics in three dimensions over multiple, interfacing layers. These enable a great deal of functionality to be incorporated into a single manifold chip with tracks down to 150 microns. These can be used for series production or just in the development stages to verify the design. Enzyme-Linked ImmunoSorbent Assay (ELISA) is a laboratory method using plate based assays to measure the concentration of analytes. 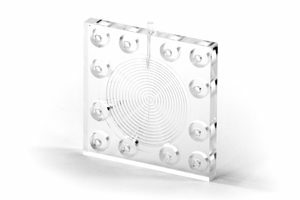 Systems typically use 96 well plates with the detection of the antibody-antigen interaction often achieved by optically measuring colour changes. Carville work with a number of companies, producing parts and sub-systems to control the delivery and control of fluids, using plastic manifolds and precision machined solutions. These solutions are often focused on improving the throughput of the systems. Chromatography (Gas or Liquid) describes a group of techniques for separating mixtures in a fluid form for analysis or use of the fluid. Systems often involve the precise management and control of small volumes. Carville have worked closely with a number of OEMs and valve companies to develop and produce complex, multi-layer plastic valve manifolds in acrylic and Ultem to deliver a complete, plug in assembly. Carville supply a number of companies with customised, precision machined solutions for laboratory equipment for both research and commercial applications. These include solutions such as flow splitters, manifolds, and complex fabrications of plastic and metal, optics, buffer wash plates, sample holders, inspection assemblies and many more.